Everything needs to be illuminated. I'm not a fan of Bukowski (never did get into his work), but it's hard to not like this quote, or at least feel the truth in it. What isn't addressed in this excerpt though is that there are times when bringing one's own light to a dark situation can be really challenging. Tragedy and trauma can make it feel almost impossible to stay positive and approach things with energy and sensitivity. I very recently learned this the hard way at rock camp. Last week I had the privilege of teaching guitar and helping out in the kitchen at Willie Mae Rock Camp during their first girls' session of the season. But with everything else that I've been dealing with in my personal life for the past few months, it didn't really feel like a privilege. It initially felt more like an expenditure of energy that I really couldn't afford, and I momentarily considered bailing at the very last minute. But both the guitar classes and kitchen were severely understaffed, and my desire to help trumped my panic. Rather than running, I chose to train my laser-like focus on making the best of the situation, and on being the most helpful guitar teacher I could possibly be. I could write in this forum that things were great as soon as I made that choice, but I'd be lying. Anyone who's ever dealt with grief and/or depression knows that getting through it takes a lot more than an attitude adjustment. I chose to put my energy and time into rock camp, and found that I had to keep making that choice, over and over again, in a lot of little energy-conscious ways. 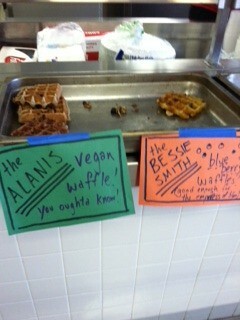 Friday morning surprise waffles for the volunteers, yay! Photo jacked from the illustrious and talented Mal Blum. Other stuff I did: I got in the habit of taking journal breaks once a day, where I would find an empty stairwell and take a few minutes to scribble down how I was feeling. I also tried to socialize and talk to the other volunteers as much as possible. My co-teacher and I kept up a constant dialogue about how class was going, and we were able to bring whatever issues that came up to the other guitar teachers and in one case, the camp staff. I also tried to talk as much as possible with the other kitchen volunteers while we were working there, and I did try, with varying success, to make some new friends. Written out that way, all that self-care work might sound exhausting, and like, well, work. Yes, it was a lot of work, especially when one considers that most of it should just be a normal part of daily life -- you know, eat, sleep, hang out, duh -- but it was more than worth it. It took a lot of effort, but in the end, I felt better than I expected to about it. What's kind of funny is that, for all of that work, the actual volunteer work wasn't that hard. Every morning I would sort of brace myself for guitar class -- I would take some deep breaths and try to let go of any negative feelings I had, and more or less pray that I wouldn't snap at an undeserving camper -- but it was never necessary. As soon as the girls came into the room and starting plugging in their guitars and fiddling with their amplifiers I would relax, and I would suddenly know what to do. 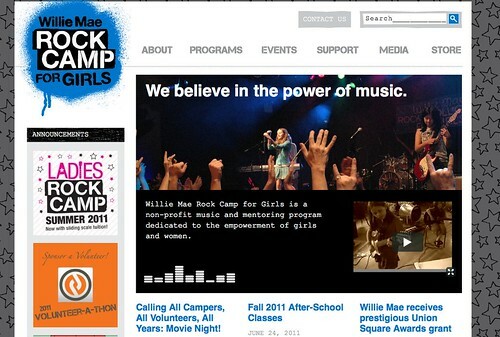 Because the reality, in my experience anyway, is that being supportive isn't really that hard, and being supportive is really what rock camp is about. Teaching is never easy, but listening to someone, simply being present, and then saying "that sounded great -- good job!" to a camper doesn't actually take tons of energy. Simply being present, and offering a snack or some leftover lunch to a volunteer who is hungry, doesn't take tons of energy either. What required a lot of energy was taking care of myself. 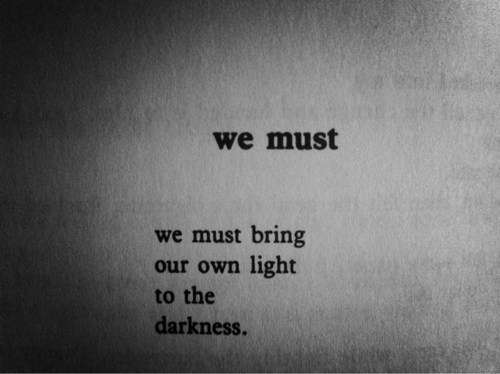 To bring it back to Bukowski (and from what I know of him, he would agree with this), sometimes we ourselves are that darkness, and we need to rely on other people's assistance. I think that I was able to get through this week, especially guitar class, because I had the energy of the campers and other volunteers to help me. There are times when we have to let others bring their light to us (frightening though that vulnerability may be); good thing we generally have a surplus of the stuff at camp.